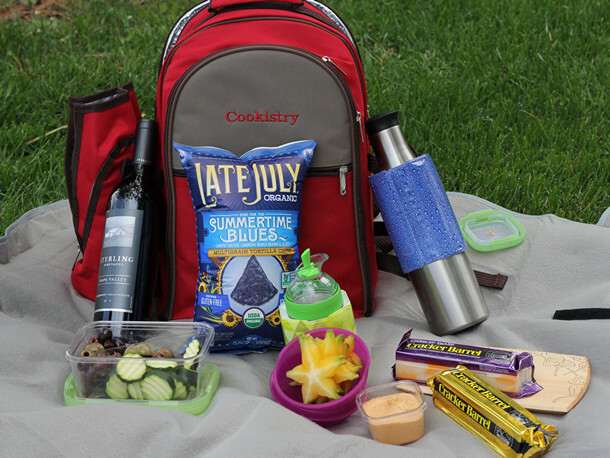 Cookistry: Packing for a Picnic? 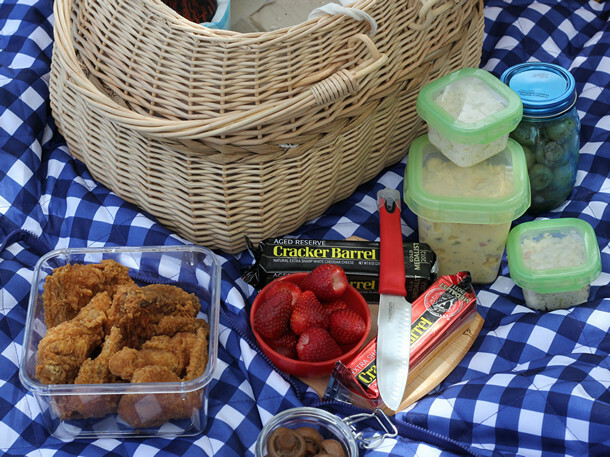 Recently, I conducted a completely unscientific poll and found that there were three distinct picnic food groups. First came the comfort food version with cold fried chicken and potato salad. Second was the wine and cheese picnic, and third came sandwiches. My personal preference is probably based on my early infatuation with Aunt Bea’s fried chicken packed in a wicker basket for Sheriff Andy. But I would never turn down wine, cheese and nibbles. 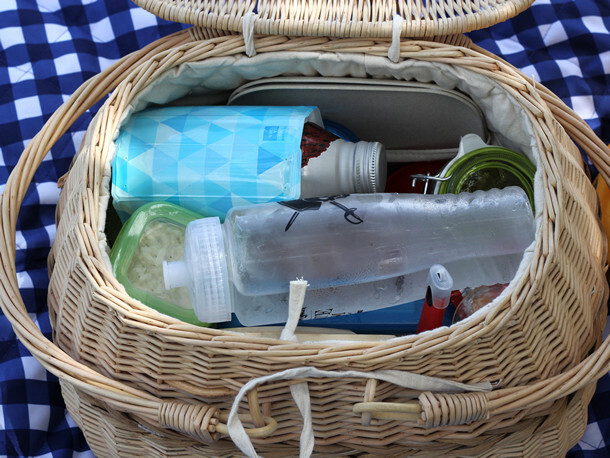 A picnic basket doesn’t need to be wicker. Or basket-shaped. 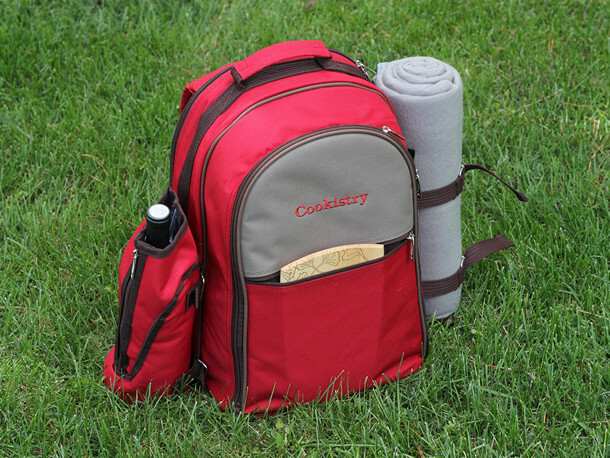 Red Envelope sells a backpack designed especially for picnicking. It comes complete with dishes, wine glasses, metal utensils, napkins, cutting board, serrated knife, corkscrew, and tiny salt and pepper shakers. 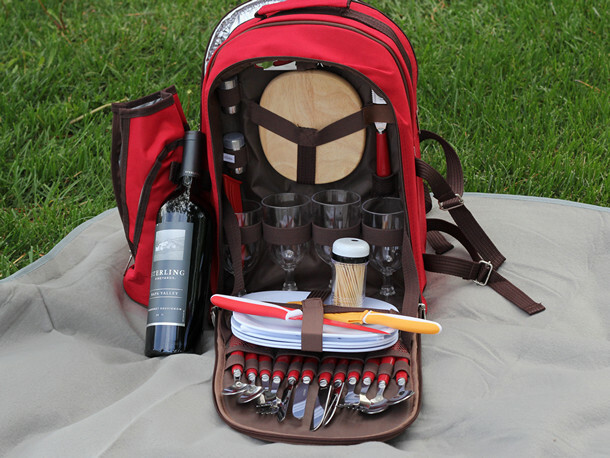 Insulated storage for food is in a separate compartment, and detachable wine storage and a picnic blanket complete the set - and you can get the backpack monogrammed, as well. The backpack basket is great if you’re doing a little hiking to your picnic space, whether that hiking is urban or back-country trails. Or, perhaps for a short bike ride. But since space (and weight) is limited to what makes sense to carry on your back, they’re probably best for wine, cheese, and nibbles, or for a few sandwiches and a few sides, rather than a huge spread. 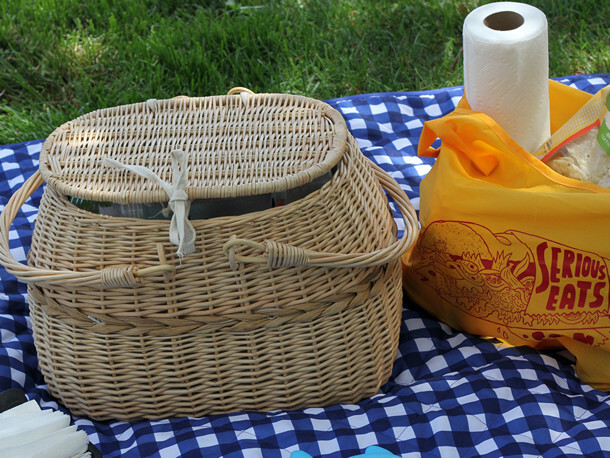 No matter what type of basket you choose (or an insulated cooler, or canvas bags, or whatever you prefer to carry), you need to do some planning when it comes to packing – because once you get to the picnic area, you can’t run back to the kitchen for an extra spoon. When it comes to food storage, we probably all know the mantra that heat rises and cold sinks, so for best preservation of chilled foods, it makes some sense to have the ice packs on top (if you’re using them – but more on that in a bit). But there’s another logic involved. Put the foods you’ll want first on top, and leave dessert on the bottom. You’ll conserve more chill by having the basket open for less time. While ice bags are useful, I found that using a freezable sports bottle filled with water worked just as well. I didn’t fill the bottle completely, since I didn’t want it to burst in the freezer, and it was the last thing to go into the basket when it was packed. Of course, if you’re going on a long drive, you might need more chilling power, but for a quick trip to a nearby park for lunch, things will stay cold long enough. And, once you’re at the picnic, you have cold water to drink. Another option for chilling that serves double duty is the Rapid Ice Cooler from Vacu Vin. Actually, there are a variety of these sleeves, designed to fit cans and bottles to chill them and keep them cool. You can wrap them around your containers before putting them in the basket (which has the added benefit of cushioning them, if you happen to be bringing glass) or you can lay the coolers on top of the basket for travel and let people insulate their beverages as they’re drinking. You can also use them to keep foods chilled, if you have them packed in containers of the right size. One thing to keep in mind is that your chosen picnic spot might not be close to running water, so if you drop your serving spoon in the grass, maybe you’d rather grab a clean spoon instead of trying clean the dirty one. In fact, I suggest bringing along plenty of extra utensils. They don’t take much space. For serving spoons and random cutlery, you don’t need to go all-out with high-end equipment. A visit to a local thrift store will probably supply you with a big handful of unmatched and interesting flatware and serving spoons for very little cost. When the picnic is over, wash them, put them in a plastic bag, and store them in the basket so you’re ready to go next time. Speaking of cutlery, bring along a few extra knives, as well. You don’t need your best equipment, but I’d suggest something better than a butter knife. A knife that comes with its own sheath is a good idea, like the Oni knife from Dreamfarm that’s designed for cutting with one edge and easy spreading with the other. A divot in the handle has a tiny sharp edge for cutting – like when you’re wrestling with one of those chip bags that just doesn’t want to open. A few small cutting boards can come in handy, too. Remember, you might not have a good way to rinse your used boards, so it might be handier to bring a few extras. While I love small flexible cutting mats, you might be working on a bumpy surface at the picnic area, so solid board might be a better choice. The “small plates” boards from J.K. Adams are small enough to fit into your basket and the designs are pretty enough to use them as serving boards for your cheese – you did think about serving that cheese, right? For the wine and cheese basket, don’t forget the toothpicks! I packed cheese, olives, and some pickled items, none of which really required plates or utensils to nibble – but toothpicks are certainly more civilized than poking in the olive container with your fingers. Buy a little toothpick dispenser and keep it in the picnic basket. How about extra glasses? Sure, you can refill your wine glass with lemonade or iced tea, but why not pack a couple extra glasses? Duralex glasses are durable enough to travel, and you can use them for serving that fruit salad you brought, just in case it’s too messy to put on flat plates. While the picnic baskets I mentioned came with their own napkins, some extras in a dispenser that will keep them from blowing away is a good idea. After the picnic, leave it in the basket or use it for back yard dining. The Simply Pull napkin holder from OXO is a good choice. I have a tendency to put way too much food on the table for dinner, but that’s fine because leftovers are easy to pack and store. At a picnic, that’s not necessarily the case. No matter how well chilled your food was when it arrived, it’s probably going to be edging towards warm if it’s been out of the basket for serving. Are you really going to pack that food up and put it in the refrigerator to serve another day? Some things, yes. The potato salad, probably not. OXO’s LockTop containers come in a variety of sizes, and the 4-ounce container was perfect for a single serving of cole slaw – no need to dish it out – just pop the top and eat. If you think someone will want a second serving, just bring extras in those small containers and keep them chilly in the basket. 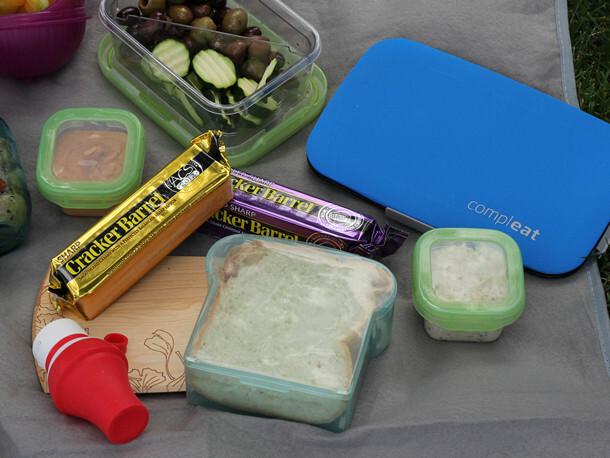 While it’s perfectly fine to pick up olives, hummus, and pickled vegetables from the olive bar at the grocery store, don’t be tempted to use those containers for your picnic. I’ve had those flimsy plastic containers open and spill into my grocery bag, and that’s not something you want to deal with at a picnic. Besides, if you’re packing munchies for your wine and cheese basket, you’ll probably want a small amount of many things, rather than a vat of hummus and a quart of cornichons. And think about how fun it will be to unpack and nibble on a whole array of small portions, while you slice your cheese and sip your wine. Remember that ice water in a sports bottle? I suggest bringing extra water or other beverages besides the wine. On a hot, sunny day, you might find yourself wanting to chug a whole lot of cold drinks. The Pure Fizz soda maker lets you bring your own carbonated water – flavored or not – and the Bormioli Rocco bottles are a beautiful way to carry your homemade lemonade or iced tea. For sandwich packing, there are two options – the pressed sandwich would be fine wrapped in foil and stashed in a plastic bag to thwart leakage, but the Compleat FoodSkin offers another option. It stretches and molds around the food inside, keeping it snug. 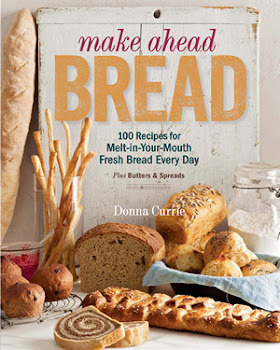 For the make-your-own sandwich, sturdy plastic sandwich containers would house bread nicely – one sandwich at a time – and meats, cheeses, and condiments could be stored separately, to avoid the dreaded soggy sandwich issue. Then we have condiments. Depending on what you’re serving, you might want mustard, ketchup, mayonnaise, hot sauce, ranch dressing, oil and vinegar dressing – but you’re only going to use small amounts. Rather than bringing a whole bottle, consider repacking, and then consider easy serving. The travel bottle from Swissmar is designed to hold 3 ounces of liquid – which you could take on an airplane – but it’s also nice for ketchup, mustard, or mayonnaise on a picnic. For dressings and sauces that are more pourable, the small salad dressing shaker from OXO holds 8 ounces and has a pour spout. If you want hot coffee with your meal, forget about carrying it in your picnic basket. Use a insulated bottle or travel mug and carry it separately. You can even find insulated containers in bowl shapes for that hot German potato salad or the baked beans that you want to serve with your sandwiches. Don’t forget a blanket, if you’ll be sitting on the ground. The blue checked blanket (from Target; not online) folds and zips to form a pillow with a carrying handle, and if you forgot one last thing, you can shove it into the zipped blanket for easy carrying. Don’t forget to bring chips or crackers to go with the cheese, salsa and dips. They’re lightweight, but bulky. It would be ideal if you could fit absolutely everything into the basket … but really, why stress? It’s not like luggage. You won’t get charged extra for bringing another bag. Any sturdy tote bag will do, since we’re not worried about insulation. While chips come in their own handy storage container to bring to the picnic, think about how you’ll take them home without spillage. Bring bag clips . Not only do they seal your bags, but you can clip one to the corner of your napkin to keep it from floating away on a breeze. 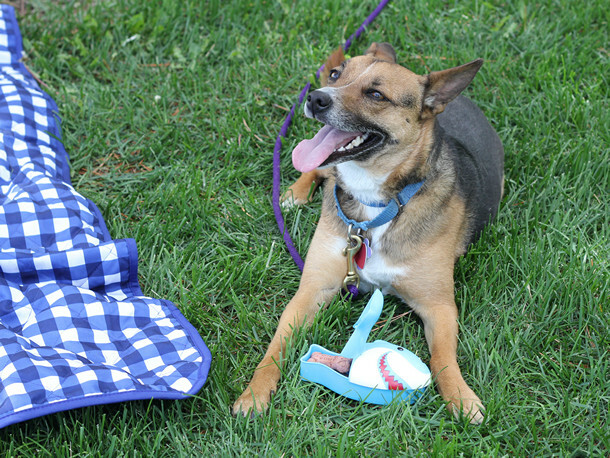 Speaking of snacking, if you’re bringing a little friend along who won’t be partaking in the main event, whether a toddler or four-footed pal, bring something a special. Snickers was amused by this shark container, designed for kids’s snacks. Now that you’ve committed to bringing a tote bag for the chips, a roll of paper towels might come in handy if things get really messy. And it’s not like they’re heavy to carry. Toss a pack of Wet Naps in the bag, too, if you tend to get messy. 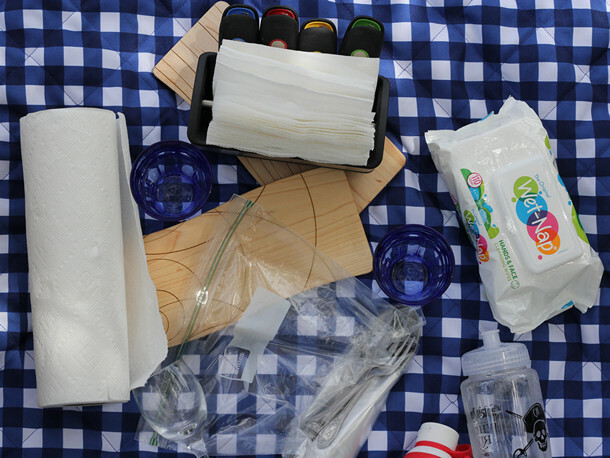 Bring along a trash bag or two, for easy cleanup when the picnic is done. Remember that running water that might not be nearby? Well, after the picnic you’ve got a collection of dirty plates, utensils, and probably some now-empty storage containers. Do you really want them dripping into your basket? Collect them and put them in a trash bag (or other reasonably large bag) to keep your basket clean, and not make a mess of the storage containers that will be heading back to your refrigerator after the picnic. Remember those chunks of cheese that came wrapped from the store? It made sense to slice and serve at the picnic, but now that the wrapper is ripped, how are you going to bring them home? Bring a few plastic zip-top bags. They take no space to carry and you might find other uses for them as well, like carting off the chicken bones when you realize there’s no trash bin nearby. If you drove to the picnic, there’s one last thing you might bring, but leave it in the car: a plastic gallon jug of water. Sure, many picnic areas have running water, but what if it’s not available? That jug will come in handy to wash sticky hands or rinse muddy feet, if need be. This previously appeared on Serious Eats. Some products were provided be the manufacturers specifically for this post; other products came from my personal stash.